Cats4Sale 177 - Catboat Association, Inc.
177-13. Blackwatch 18' gaff cat. You don't have to take my word for it, but this is one heck of a sailing boat. 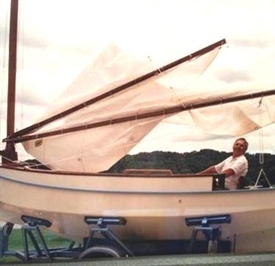 Back in the '70s I designed and built a 50' cutter yawl See you tube "Sail the Daedalus" a 6 minute aerial video. Ok, to Blue Water Manufacturing, Amarillo, Texas. Blackwatch 18. They fabricated 80 Blackwatch 18' cutters and on the same wide full keel hull they custom built only one Blackwatch 18' gaff cat, Then closed shop because of illness. The full keel draws 24". There is no cumbersome center board and no barn door rudder is necessary. There is lots of equipment including a 6 hp Tohatsu 4 stroke, long shaft Sail Pro. The two axle trailer is not great but it tows it around so far. This 84 year old loves this boat, but must finally sell her. $15,000 https://www.youtube.com/watch?v=0G7auDMHoBY Capt. Fred (251) 987-1200 biophilia@gulftel.com On the Gulf Coast of Alabama. 177-33. 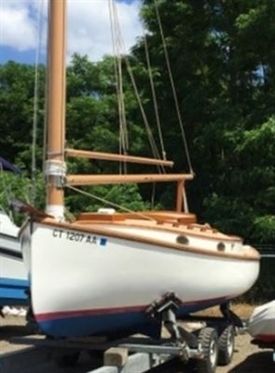 1981 Marshall Sanderling 18 for sale, located in Charleston, SC. Very comfortable Catboat. Tanbark sail, tabernacle mast, rigging, cockpit and berth cushions, and trailer are all in splendid sail or drive away condition. Asking $13,500. Contact Nelson Ohl at nelsonohl@icloud.com for additional information and photos. 177-44. Handy Cat 2004 Clean and in excellent condition stored inside. Low maintenance fiberglass, this Handy Cat is a safe, (beam 6'8") fun, dry sailing, comfortable, boat for solo or family sailing. Retractable center board allows her to be beached. She draws 12"of water with board up and 54" with centerboard down. 2008 EZ Load trailer like new with oil hubs. No need to repack. Sail is excellent. Blue mooring cover. 2.5 Honda motor(still under warranty) available. Dean Coe 508-648-2303 Possible mooring sharing in Barnstable Harbor. 177-55. Used navy blue sail cover for Marshall 22. Asking $150. It’s in good shape and fits well. I recently purchased a new dodger and sail cover of a different color. Please contact Brian Smith at 781-290-6393 if interested. 177-58. 1976 Marshall 22 "The Dude" Yanmar inboard diesel rebuilt in 2014. All new rigging and new radio also in 2014. Tanbark sail. New mast and new stereo in 2015. Sunbrella sail cover and dodger. Excellent condition overall. REDUCED to $15,000 or BO. In Barrington RI currently. Contact John Coen at jcoen1@me.com or 617 571-8938. 177-67. 2007 Marshall 15' Sandpiper. Immaculately maintained Marshall Sandpiper with great race history available. Turn key boat with many recent upgrades. Ceramic coated hull sides. Updated running rigging. Two year old mast up full side boat cover. Winter storage cover. 2 sails (2016 Beaton and 2014 Beaton). Additional 2018 Beaton sail with 3 days of use available at extra cost. TackTic Compass. Hull drain plug installed. Weighed in at min weight with corrector weights at 2018 Sandpiper Nationals. Boat has been stored indoors during winter season. MagicTilt trailer with non-flat dolly wheel installed on tongue. Asking $19,500. Contact Sean at 917-699-6019 or seanbradley05@yahoo.com Boat is located in NJ. Delivery can be arranged. 177-73. Cassiopea is a keeled Catboat modeled after Charles Wittholz' Prudence. She is 25ft on deck with a 11.5' beam. Built in 1991 near Genoa Italy, she is Mahogany plank on frame. If you’re a class boat racing fan, she won the Indian Harbor 2017 Catboat class and the Spirit of Tradition Division. and the 2017 Heritage cup Catboat class. With her wide beam she has plenty of room with 2 queen size berths. Contact Mark Mark.Williams.T@gmail.com Features: Electric windlass, 100+ feet of chain. DC refrigerator. New water heater 2016; New wireless windex 2016; New waste tank 2016; New dripless shaft seal system and new bearings; Mast stepped, stripped and varnished 2016; Navtext data Depth sounder; Raymarine tiller pilot; VHF new 2016; Stereo with bluetooth new 2016; New battery charger 2016; Pressurized water and foot pump; Repainted 2018; Alcohol stove; 37 HP diesel Lombardini 1204. REDUCED. Asking $35,000 - more pictures are HERE.